Our annual My Entertainment World Award Season begins today. 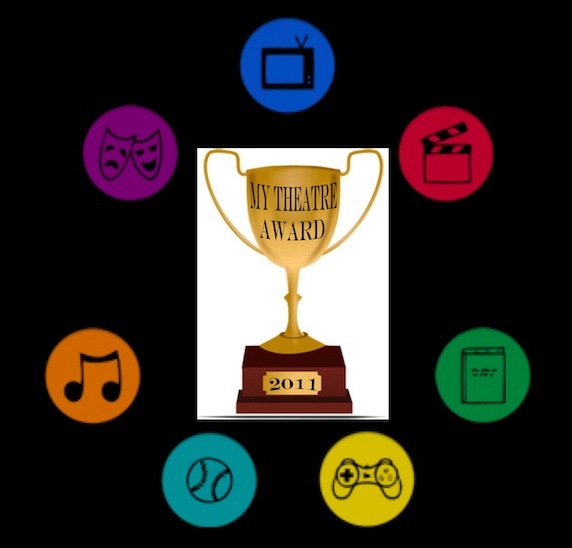 We’ll start with the nominees for our second annual My Theatre Awards; the fifth ever My TV and second My Cinema Award nominees will follow soon. Then we’ll kick off our Nominee Interview Series and announce the Winners, Performers of the Year and recipients of our yearly Honorary Award. The following is a list of the 2011 My Theatre Award nominees. Any production that one of our writers saw between Jan 1 and Dec 31 2011 qualifies for an award. Nominees have been divided into 40 categories in 4 areas: National, Regional, Student and Other. *the asterisk is because Pavelka deserved a nomination but his division doesn’t have a Best Designer category, so we bumped him up. My vote to “Best supporting actress in comedy” goes to Mayim Bialik from The Biig Bang Theory. Fallujah is a masterpiece and everyone involved with it deserves to win. It was an amazing piece of work. Thank you for consideration, Kelly! Highest praises from everyone involved in SWEENEY TODD.